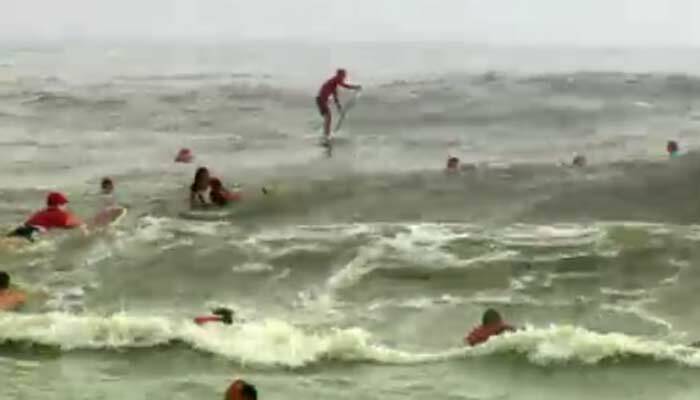 WESH/CNN) - Hundreds of Santas took advantage of warm Christmas Eve weather to ride the waves in Florida. Surfing Santas is an annual event to help raise money for local charities. Jarryd Foster, Mark Visser, Chris Ross and Justen Allport have stolen Surfing Life's Oakley Big Wave Awards 2015.The finest big wave riders in Australia were crowned in the "Biggest Wave," "Biggest Paddle-In," "Biggest Slab" and "Viewer's Choice Award." Foster won the most coveted award for an epic ride at Cow Bombie. The Western Australian surfer walked away with the $20,000 winner's cheque. Cork is slowly entering the surfboard world. Shapers are giving it a go; surfers like its consistency. But we had never seen a board shaped from recycled cork stoppers.A group of social entrepreneurs from Murcia, Spain, has shaped and developed a patented-protected surfboard made of traditional cork stoppers. When the wine's over, cork stoppers are excellent buoyant materials. So, why couldn't they be cut and shaped into a classic shortboard? Is it forbidden? If not, let's get the hands dirty. The International Surfing Association (ISA) has announced the ISA World Championship Series schedule for 2015.The governing body for the sport of surfing has planned eight competitions taking place in four regions. The world's best SUP racers, SUP surfers and paddleboarders will travel to Sayulita, in Mexico, for the first event of the 2015 season - the ISA World StandUp Paddle and Paddleboard Championship. The ISA will debut its first ever World Adaptive Surfing Championship in 2015, underlining surfing's inclusivity and widening the sport's global reach - further boosting surfing's prospects of Olympic and Paralympic inclusion. An Australian researcher has concluded that surfers are saving as many people from drowning as volunteer surf lifesavers.Anna Attard, author of the study "Guardians of the Surf: The role and value of surfers in Australian beach and coastal surf rescues," noted that surfers rescue 5000 people per year in patrolled (45 per cent) and unpatrolled (54 per cent) spots. "Surfers with prior water-safety training are more likely to perform a higher number of rescues, however ability to perform rescues is not associated with formal training but rather number of years' experience surfing," Attard told The Sydney Morning Herald. How Can Surfers Rescue Struggling Swimmers? Surfers save lives. When wave riders are out in the line-up, there may be swimmers in trouble, more or less far away from firm land. No matter if it's summertime, spring, winter, or fall. Rip currents are responsible for 80% of all rescues in the surf environment, and take away about 150 lives every year in the United States. Strong rip currents can move people at eight feet per second. Surfers are willing to do anything to get that dream wave. Even to paddle around icebergs in near-zero temperatures.Videographers Mikey Corker and Chris McClean and photographer James Bowden traveled to Iceland with a group of surfers in search of new and challenging waves. The journey to the edge of the Arctic circle has been documented in "Lost and Found," a beautiful essay on the power of Nature and surfing.